I really hated this on me all day yesterday, but it's growing on me. A little. 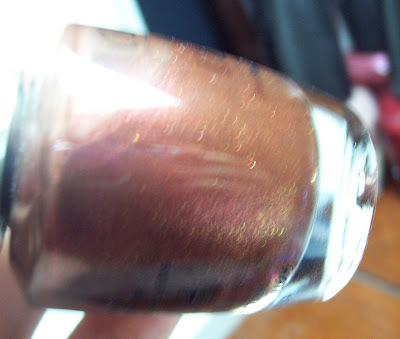 The base is a dark reddish brown with glitter. The way the polish applies reminds me of Lubu Heels. The glitter sparkles gold, green, pink and a bronze to match the polish. I wore 3 coats. You really should click this picture above to see the glitter! This was nearly impossible to photograph, but mainly you only see the pink sparkle. You have to look pretty hard to see other colors unfortunately. The shimmer that OPI polishes are made up are nice. Not TOO glittery, just right. Again, another good color for you! I agree with Denny, shimmery, but not too shimmery. And always such a unique finish. I think it looks really good on you! I enlarged it, and now I'm in love. I do like it on you! I think it's a gorgeous color. I was surprised it's not a holo too! Hi Nicole! Thank you, I like it too. wish it was holo haha. Danielle: lol yah. I have an older 6.1 megapixel Kodak EasyShare, maybe 4 years old now =x. I have no control how it turns out since it's point and shoot but it takes ok pics. Oohh what a beautiful color ! so pretty !